1952 Topps Mickey Mantle #311 PSA Mint 9. It might be your wife. In fact, if you're married, it almost certainly will be. It might be your mother, or your children, or your friends at the country club, but you will, undoubtedly, be met with a single question after recording your winning seven-figure bid for this card. "Are you out of your mind?!" And we understand. Believe us, we do. 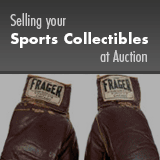 Here at Heritage Auctions, where we sell hundreds of six and seven-figure collectibles every year, we're called upon constantly to justify price tags that would strike many, if not most, as outlandish. "You could buy a [car/house/private island] for that money!" they'll protest. We'd advise that you calmly answer that, yes, one could buy those things but, no, you are not mentally ill. You simply understand something that they do not. So let's talk about what that is. In its simplest, unsentimental terms, an elite collectible such as this offering represents the purest distillation of the law of supply and demand. In that regard, it is entirely accurate to consider the value of this glorious example of Mickey Mantle's 1952 Topps card as grounded in the densest of economic bedrock. The stomach-churning waves of a Bitcoin graph are nonexistent in this world. There can be no Enron crash. There can be no Madoff swindle. The supremacy of the 1952 Topps Mickey Mantle #311 card in the entirety of post-war trading card collecting is a matter of record. Likewise is the known population of that card assessed by the leading trading card grading service, and the quantity at each grade level. A vast archive of sales data, from hundreds or thousands of transactions across innumerable selling venues, charts a steady ascent at every grade level (though, admittedly, that data tails off as we climb to the upper reaches-it's been a decade since the last Mint 9 example tempted a bidding audience). Of more than 1,500 submissions for PSA assessment, only six 1952 Topps Mantle cards have earned a Mint 9 rating, with just three rising higher, to a perfect Gem Mint 10 assessment. Heritage has recorded two world records for high-grade specimens in the past twelve months: $660,000 for a NM-MT 8 example, and $1,135,250 for a NM-MT+ 8.5. The sale of this Mint 9 representation, widely considered by the small cast of experts who have examined the half-dozen as one of the finest at the grade, will set a new benchmark for the issue, and for post-war trading cards at large. It takes a special kind of collector to rewrite the record books, to plant the highest flag on the monetary mountain. But we wouldn't call him a madman. We'd call him a visionary. In the end, the successful acquisition of this enormously important card represents a most attractive form of portfolio diversification. Beyond the market principles that so convincingly designate it as safe harbor from an unpredictable financial sea, the 1952 Topps Mickey Mantle serves as one of the foremost articles of twentieth century Americana. Could you say the same of the stocks in your Charles Schwab account, or the gold bars in your bank's safe deposit box? This card is a towering symbol of American exceptionalism, from its celebration of our national pastime to the fearless ambition of creator Sy Berger's vision to the exaltation of a culture that could elevate a poor kid from the Oklahoma coal mines to the pinnacle of fame and acclaim. It is ten square inches of the American dream, preserved virtually flawlessly for eternity. It is a commodity recognized and coveted by millions, yet available to only a tiny handful of the most sophisticated collectors. What's so crazy about investing in that? Along with standard payment methods, we will be accepting cryptocurrency for this lot at the request of our consignor. The following cryptocurrencies will be accepted at their spot value at the time of payment: BTC, ETH, XRP, BCH, LTC, NEO, DASH, IOTA, & EOS. Others may be accepted if arranged before the closing date.